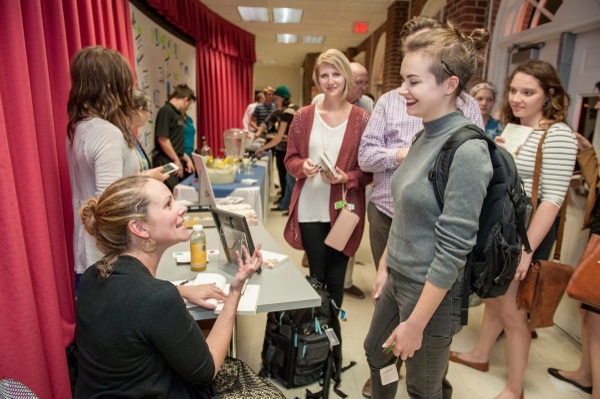 Caroline Orth (right), a BFA student in the creative writing major, speaks with guest author Clare Beams during Writers Week 2016. For undergraduate students, we offer a Bachelor of Fine Arts in Creative Writing, as well as minors in poetry writing and in creative nonfiction writing to students in other majors. Our BFA offers sought-after credentials in writing and publishing to undergraduates with a wide range of career interests. Our curriculum combines workshops in fiction, poetry, and creative nonfiction writing with courses in literature, hybrid genres, and special topics. We also offer a Certificate in Publishing to BFA students, and make available classes in editing, book design, and other publishing topics through our Publishing Laboratory, and in screenwriting through the Department of Film Studies (though we do not offer the BFA degree in screenwriting). 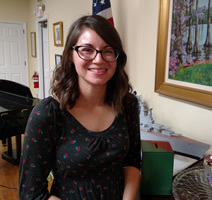 Melissa Parthemore, a senior creative writing major in the fiction track, is the recipient of the 2015 Creative Writing Scholarship sponsored by North Carolina Sorosis, a philanthropic organization based in Wilmington.